Hi lovely people ! I hope you are fine and you had a good day, because mine was TOO COLD. We had a cold wind and people were also wearing their winter stuffs. It was also raining… I had to wear a jacket, a pull-over and warm shoes otherwise I would have get too cold. I had that strange feeling summer was over 😉 I’m just joking;-) Anyway, I though myself “although it’s cold outside, I’m not going to wear dark clothes”. I’m pretty sure that, dark clothes bring you in a sad mood (that’s my opinion, maybe I’m wrong). I hope you will like that “colourful” and classy outfit. Take good care of yourself. J'aime beaucoup cette tenue et le jaune te va à merveille et puis les mocassins j'adore !! @ Lamia : quelle chanceuse, 36° !!!!! Je savais que cette composiition te plairait;-) Mille bisous ma belle ! those yellow pants are so much fun! 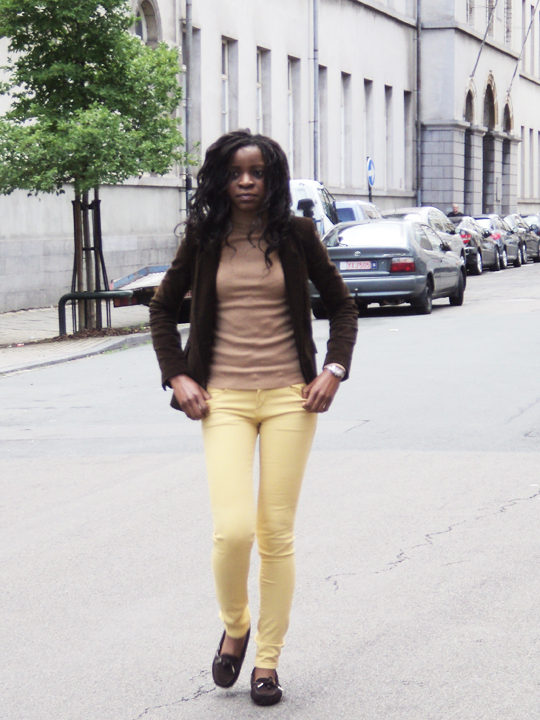 @ Zarna : Y're right my dear;-) I hope your day was colder than mine;-) xoxo from Brussels honey ! J'adore le slim jaune qui te va très bien. Your yellow pants are lovely and flattering! And your loafers are really elegant! Following you now both on Bloglovin and Google, I would love it if you followed me back! @ Chrysa : Thanks my dear for your visit and your lovely comment;-) Basically, Brussels is not so cold. But saturday was particularly cold for the season. If your brother flying from Zurich, I'm pretty sure he will enjoy the weather here;-) I will follow back with pleasure ! Hi Celine! Just followed you back in FB as well! Thank you so much for offering to provide explanations for Brussels:) He already visited your city once for 3 days and he loved it! He is a doctor, oncologist, he will be working at Jules Bordet Institut. I will see whether he has any questions for the city to ask you! Thank you so much!